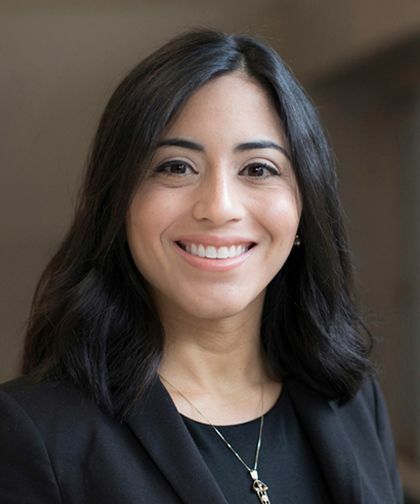 Lizamarie Bachier-Rodriguez, MD, is an Attending Physician at Montefiore and an Assistant Professor of Medicine at our Albert Einstein College of Medicine. Since joining the Montefiore team, her clinical focus has been on developing new strategies to minimize toxicities for bone marrow transplant recipients and to improve the way we use novel cellular therapies to treat complex blood malignancies. In 2007, Dr. Bachier-Rodriguez received her Bachelor of Science, followed by her Doctor of Medicine in 2011 at the University of Puerto Rico. She began her postgraduate training with a residency in Internal Medicine at the Hospital of the University of Pennsylvania, which she completed in 2014. Following this, she began a 3-year fellowship in Hematology/Oncology at Weill Cornell Medicine. Dr. Bachier-Rodriguez began a second fellowship in Advanced Bone Marrow Transplant at Memorial Sloan-Kettering Cancer Center in 2017. Based on her clinical focuses, Dr. Bachier-Rodriguez’s research takes a deeper look into hematopoietic stem cell transplant outcomes and toxicities. In 2015, she was part of a year-long research project with Weill Cornell Medicine and the Department of Hematology and Oncology. The 2 main goals were the expansion of cord blood hematopoietic stem cells for allogeneic transplantation and the expansion of adult bone marrow hematopoietic stem cells transduced with anti-sickling beta globin. Her work has been published in a number of articles, books, reviews, and abstracts, and presented at meetings nationally. Dr. Bachier-Rodriguez is board certified by the American Board of Internal Medicine in Medical Oncology and Hematology. She is also a member of numerous professional societies, including the American Society for Blood and Marrow Transplantation, the American Society of Clinical Oncology, and the American Society of Hematology.